Psalm 92:12-14 The righteous shall flourish like a palm tree, He shall grow like a cedar in Lebanon. Those who are planted in the house of the Lord shall flourish in the courts of our God. They shall still bear fruit in old age; they shall be fresh and flourishing..The Bible says the only way we will flourish is by being planted. If you aren't committed to the church, you will miss many benefits promised in God's Word. In this scripture, the will of the Lord for His people is stated very clear. It is for them to be planted in His house--to have roots in your home church. The word planted offers the meaning of being stationary or permanent. When something is planted, it does not move around. It is in a fixed location. For so long in the body of Christ we have had people who bounce around from church to church. When some do, they half way settle into a church; but they get easily offended if something isn't the way they think it should be and drop off. This is not the plan of God for any believer. Many of these same Christians travel from conference to conference but refuse to be planted. Meeting, seminars and studies are wonderful and can benefit believers immensely, but they should never be considered a substitute for the local house of the Lord. Other Christians thrive on spiritual food from televangelists but do not attend a local assembly, nor should TV ministries take the place of the local church. The Greek word for "church" is ecclesia. It means "a calling out and assembly." You, by yourself, are a member of the body of Christ; but when the members assemble together, we have the church. Since the church means "calling out" or "the called out ones," then know that God is calling you out of your house in order to be planted in His house! The Scripture promises that those who are planted will flourish. Flourish means "to break forth as a bud", in other words, breakthrough! We have teaching and believing for breakthrough for all of us. Those who are planted will have breakthrough in their lives. "Flourish" is also defined as "to blossom and to spread." Nothing blossoms without being planted. Planting is the prerequisite for the satisfying of God's promise. We have found that the ones who have had the greatest and largest number of obstacles have been those who had a history of not being planted. I believe many of the challenges we face can be avoided when we are planted in the house of the Lord. Protection, safety, encouragement and blessing come when we join a local church that teaches and preaches the Word of God. The passage above from Psalm 92 also says that those who are planted will be fresh and flourishing (v 14.) These two words mean "rich, fertile and prosperous." As a result of your being planted, there will be richness in your life that will cause fruitfulness and increase. You will be a productive individual excelling in all you put your hand to. God's promise is abundance and prosperity for the man or woman who is planted. Why do you think the Lord wants you in church? Because He knows exactly what each of us needs to be able to grow and develop spiritually. Often we think we know better than the Lord. However, Jesus said that the "'Father knows the things you have need of before you ask Him" (Matthew 6:8) If the Father knows what we need, then He knows what local church will meet our needs. As we are planted in that place, we will grow, mature and develop spiritually. We should go to church expecting to be changed, not try to change the church. YOU are the one God seeks to change. Don't get in the critical mindset and critique everything you think is wrong with your local church. Press in for Him to work on YOU. We must allow the Spirit of God to have His way in our lives and plant us. It will be to our benefit and save us from the heartache and confusion produced by being unplanted or living with shallow roots. God is the one who chooses; our job is to agree with Him about His will for our lives. The choice to obey will empower God's blessing. The House of God is the dwelling place of the righteous. 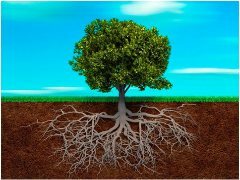 When our roots are deeply established in the Word of God and the feeder roots are seeking the life of the Spirit and the Word, our soul will quickly grow into maturity and usefulness. EVEN IN OLD AGE! !